“It’s not… nice.” I turned to see if he agreed. We’d been working and saving hard to buy a house and the process felt heavy, loaded with psychological and financial bombshells, a huge decision for neophytes like us. It was 1998 in Berkeley, California, a year after we’d married. We didn’t have much money but were unwilling to take on a lot of debt so we were looking at the the smallest, shabbiest dumps on the market, trying to figure out how little we could live with. This is something I love about my man: We’re standing there in a house that’s been on the market for over a year with no takers, a half-finished, one-bedroom dive reeking of mildew and cat piss, and he’s willing play what-if with me, he’s willing to give it a try. This ability to see through surface flaws and fissures to an inner solidity is a large part of why we’re together. 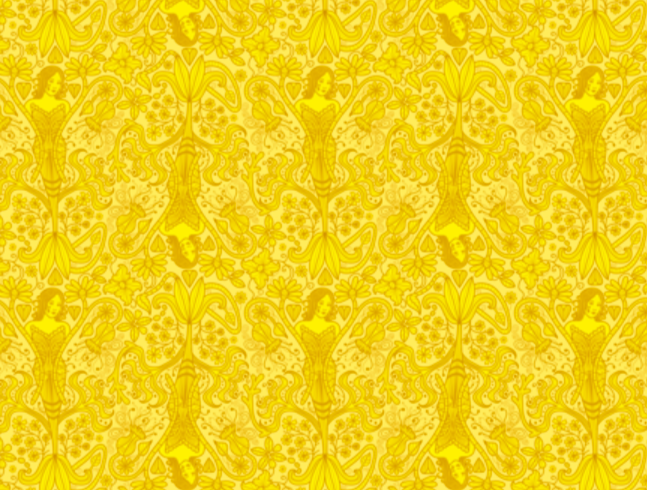 Whenever I see wallpaper, I think of the famous gothic story, The Yellow Wallpaper. I must have been in high school when I first read about the nameless narrator in Charlotte Perkins Gilman’s pre-feminism allegory about the woman whose patronizing doctor-husband confines her to an attic nursery as a cure for her postpartum depression, even though she’s desperate for activity and distraction. All she has is that oppressive wallpaper, “one of those sprawling flamboyant patterns committing every artistic sin.” There’s nothing for her to do but study the walls and in their design she begins to see fungus, bloated faces, an endless parade of mushrooming forms, and the bars of a cage. As she slips into psychosis, she imagines women creeping around behind those bars, women trapped like her: shaking, rattling, desperate to escape. 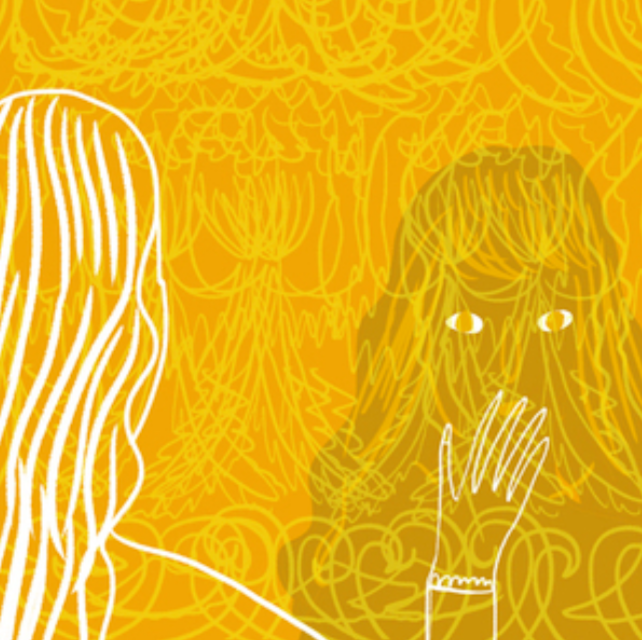 The Yellow Wallpaper is stuck fast in my imagination and when I read it again after I’d had kids and my own bout of postpartum despair, I perceived a whole new dimension. Sometimes, when I’m slipping into some old rabbit hole of thought, standing on that worn spot on the floor in front of the kitchen sink washing a dish I’ve washed countless times before, I close my eyes and remember how she crept around and around in fast-forward, eyes swallowed in black and her left shoulder stained yellow from rubbing against the wall, and I step away from the sink: step away. One of the first short stories I ever wrote was set in a one-roomed house that was supposed to represent a head. There was no door, only two eye-like windows through which the main and only character gazed mournfully at the world while he went slowly nutso. Yes, I was heavily inspired by Edgar Allen Poe and yes, the story lacked plot but still I thought it was terribly clever. It was the first piece of writing I ever showed my father and I watched him read it like a dog watches dinner. Eventually I learned that a setting can’t be an end in itself but it certainly can have a life of its own, a juicy personality and a very large presence. I’m thinking of that wallpaper and of Gatsby’s house on West Egg, the mental hospital in One Flew Over the Cuckoo’s Nest, the remote cabin in Bennett Sim’s House-Sitting, Ruth’s place in Housekeeping, 124 Bluestone Road in Beloved, Tara, Hogwarts, Downton Abbey: these are wondrous sites, realer than any real place I’ve only read about, solid virtual structures built to house specific ideas and moods. Without these places, these stories would have flopped. In fiction, characters settle into hollowed-out spots custom-designed to fit them and no matter how hard they rattle and rage, they are stuck in the life the writer has designed for them. Watching a character wrestle with a setting can make for great writing. Readers lounge on fluffy clouds high above the arena, pointing and laughing at those poor characters. In life, setting is just as important as plot: Our lives are shaped by where we live but the liver is not as free as the writer to decide. Although we do have free will, history, gravity, and inertia conspire. In life, we might not attain the perspective to see where we are and when we get stuck in a setting that doesn’t fit, we might languish there forever. It’s possible that no one— not us, no onlookers, no reader— will ever learn from our story. After John and I bought the house, we spent days vacuuming up cat hair and repairing damaged subfloor before we put in bamboo floors. We had to buy a new refrigerator to replace the old one (which was clotted with a black pool of blood and held together with duct tape) and a new stove to replace the countertop electric burners (under which John had found a dead rat). John took countless trips to the dump to get rid of the garbage, including a hundred or so empty wine-in-a-boxes we found stacked along one side of the house. I used a razor to scrape the film off the windows, crawled up into the rafters with a bucket of suds to scrub off the plaster and matted cat hair, and attacked the walls with a wet brush to scour the plaster as flat as possible. Because the crowbar didn’t work, I was standing in the tub removing the filthy brown tiles with a pickaxe, heaving the spiked end at the wall like a rhythmic tile-removing machine, a home-fixing maniac, filling the room with the crunch and ring of metal against tile, when I felt eyes on me. I turned around and saw John standing in the doorway, just home from work. In life, the process of finding our place is nothing short of miraculous. I have lived many places: some felt like cashmere and some fit like a stiff uniform while others gave me a wedgie but in every place I’ve lived, I’ve felt the push-pull of spatial influence, I’ve experienced the pressure an environment puts on an inhabitant and how function follows form. I suppose your mother is always the first place you lived. In 1966 when my mother was pregnant with me, my parents lived in an apartment on Jones Street in San Francisco. She was working on her MFA and although the apartment had no room for a studio, she’d arranged to use an airless, windowless space in the basement to paint in, more like a closet than a room. I can almost smell the fumes from the oil paints when I imagine her standing there under a florescent bulb at the easel, holding a paintbrush in one hand and a cigarette in the other, her burgeoning midsection dabbling against the canvas. She quit smoking years ago but still, when I smell a cigarette, I remember my mother and that choking smoke that crept in my nostrils and clung to my hair. Although I remember nothing about that apartment on Jones Street, still I suspect I carry that foggy city light and those fumes somewhere inside. Ralph Waldo Emerson said that “every spirit makes its house, and we can give a shrewd guess from the house to the inhabitant.” I would add that houses make spirits too and while saying those words, I would suffer a wave of anxiety thinking that you might see into my bedroom or bathroom or kitchen by looking at my face. But it’s true—if a character grew up in Gatsby’s mansion, she certainly would look and think and act differently than if she were raised at Grey Gardens. What does it mean if I have a mean backhand, my loafers match my belt and, with one sniff, I can determine the denomination of a bill? Or what if I ate cat food from the can, wore a pantyhose sarong, and hung a lightbulb in a birdcage over my mattress on the floor? It might mean I grew up with money in East Egg or without in East Hampton. After Jones Street, we moved to a more kid-friendly spot in the suburbs: 11 Lincoln Avenue in Mill Valley. Our little white colonial had bright red wall-to-wall shag carpeting and a cherry tree in the back yard. My tow-headed, wild-eyed brother was born there and as soon as he could walk, he was running with scissors. My father built a fort in the back yard. I remember Kodachrome Easter hunts on the bright green lawn with all the boys dressed in pastel seersucker and the girls in eyelet dresses. Blue sky and green grass. Life was pretty and flat as a snapshot. If we had stayed at the Lincoln Avenue house, would my parents’ marriage have lasted? Could I have grown up to be a clean-cut girl in a pretty dress? Doubtful, but still I wonder. I’ve visited many places I would not choose to live, on the sides of cliffs or on land so flat there’s not even a tree to break the monotony; in blistering heat, in air conditioning, or in the cold acidic shadows of redwood trees, overlooking a noisy highway, in gated communities insulated by wealth, in an airless apartment high above the city, in a stagnant tract of identical houses, in a slum. If I stayed there, I don’t think I’d remain the person I now refer to as “me.” But there are times in life when you don’t get to choose where you live. Childhood, for example. During your most formative and impressionable years, you have the least power to choose. My father wanted a bigger house so we moved around the corner to 94 Roosevelt Avenue, a cavernous old haunted thing under deep shade. Even from the outside you could feel the psychic congestion emanating off those weathered wood shingles and inside, it felt like a tragedy. (Did this feeling seep into the walls before or after we moved in?) It had high ceilings, hardwood walls and floors, and a little cupola on the top where my parents installed a padded meditation room accessible only by ladder. If I were to psychologize that house I would say something about this room, its brightest, its headspace, the room with the best view, ostensibly designed for meditation but probably used for smoking dope or escaping from the kids. If I could get 86 Roosevelt to lie down on my couch and answer a couple questions, I’d want to know about its past. I had many nightmares in that house or, to be exact, one repeated half-dream: I’d lay on my bed, stuck fast, as if the sheets were made of dry ice, while a thin, jaundiced man paced the room, ranting at me. I don’t remember exactly what he said, just that he was so full of self-righteous anger and disgust it emanated from him in sour waves and I could not move or speak to interrupt him. I was frozen in place and all I could move were my fingers, which I’d rub against the silky edge of the blanket I used to comfort myself. The next morning I would ask my mother to please not let that man come into my room again and she would tell me it was only a dream. Sleep paralysis is a phenomenon in which people, either when falling asleep or wakening, temporarily experience an inability to move. More formally, it is a transition state between wakefulness and rest characterized by complete muscle atonia (muscle weakness). It can occur at sleep onset or upon awakening, and it is often associated with terrifying visions (e.g., an intruder in the room), to which one is unable to react due to paralysis. Sleep paralysis has been linked to disorders such as narcolepsy, migraines, anxiety disorders, and obstructive sleep apnea; however, it can also occur in isolation. What a relief. For years I thought that angry man was my goblin godfather or a ghost and that he’d keep coming until I learned my lesson. My bedroom shared a wall with my parents’ and sometimes, late at night, I’d hear the ominous rumbling of their voices. I couldn’t hear what they were saying but I knew it wasn’t good and when they separated, my brother and I moved away with my mother and the night terrors stopped. But still, a setting gets into your head and sticks like wallpaper. Because I lived there, somewhere inside my head there’s a livid ghost pacing back and forth, spitting criticism. A psychiatrist would probably say that ghosts aren’t real, that they’re merely projections of your own inner fears and frustrations. For both the woman in The Yellow Wallpaper and my 5-year-old self, it’s not hard to see how this makes sense but it doesn’t make the ghosts any less true and I will always be haunted by the very real, very eerie sensation of being trapped by a setting. One night, John and I are lying in bed upstairs. We put carpet down and painted the walls so really, none of these surfaces were ever touched by anyone but us. It’s late at night, we’re snug in bed, but we’re preparing for disaster. Me: How many exit routes do we have, anyway? Him: I count four outside doors. And 13 windows not counting the bathroom window, which is too small to count. Me: There are 13 transoms and skylights. So 26 if you count them all. Him: Yeah, but you’re not going to crawl out of a skylight, are you? Me: I guess I’d need a hammer to break the glass. (*pause*) If there’s a fire and we’re upstairs in bed, how are we going to get out of here? Him: We can climb out onto the roof and then shimmy down the fig tree. Me: The fig tree isn’t strong enough to hold us. Him: It will be by that time. Me: Okay. (*pause*) But if it’s an earthquake, then what? Him: We’ll be fine. Just hold on and ride it out. Me: If this house has lasted since 1903, I suppose it’s liable to keep lasting. Him: You couldn’t knock this house over if you tried. After Roosevelt, my mother, brother, and I moved across town to little house originally built as a hunting cabin back when mountain lion, bobcat, bear, and elk could be found on Mt.Tamalpais. The living room was the original structure, a plain rectangle with hand-milled redwood panels and beams and a rough tile fireplace; a bedroom, an office, a bathroom, and a kitchen had been added later. The bathroom had an enormous claw-footed tub and inside the medicine cabinet was a faded doodle of a man looking over a wall with the words “Kilroy Was Here.” Above that, “Free Huey” was scrawled in fresher ink. My brother and I liked Kilroy and Huey and persuaded mom not to paint them over as she slowly fixed the shabby place up, put in skylights, walled in the porch to make a guest room, and eventually converted the basement into a room for herself. The house started as a single cell that evolved and multiplied to adapt with our family. We knew exactly which boards creaked underfoot, how the dust motes floated in the sun, and how the wide view of the valley would wriggle and waver when viewed through old glass. Frank Lloyd Wright said that “organic buildings are the strength and lightness of the spiders’ spinning, buildings qualified by light, bred by native character to environment, married to the ground.” Our house looked nothing like a Frank Lloyd Wright but it certainly felt organic, especially after mom resuscitated the sprawling, terraced garden and let the cypress hedge grow high but even inside, nothing was fixed in stone. Chairs and small tables moved from room to room like lumbering animals whenever anyone felt like a change and mom used the walls as constantly changing gallery space for her latest paintings. First my brother and I shared the bedroom, then he moved into the office, then we switched, but I’d often sleep on the porch or the sofa or set up camp in the closet or pull my sleeping bag up onto the roof or even climb up to make a nest in the cypress hedge which was overgrown with maidenhair vine that wove a soft, dense mattress high above the ground, and when I slept up there in the arms of the trees, the wind would nudge and toss me in every direction and by morning, I’d feel completely changed, estranged from earth and only tenuously human. I’d walk back into the kitchen like a fallen bird and hold the warm cup my mother gave me with both hands, its warmth as astonishing and inexplicable as soft boiled egg. Is there a sticky residue marking the place where you first fell in love? Does trauma leave a trace? 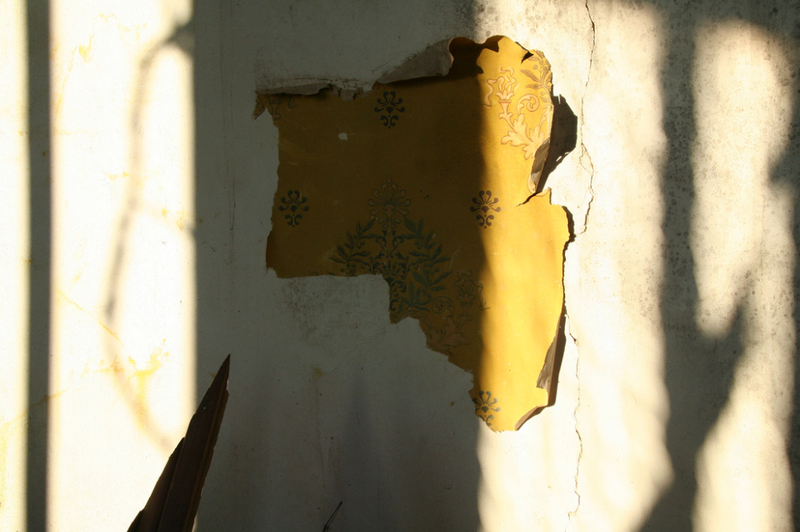 If you lived in a place long enough to memorize the cracks on the ceiling or cared enough to paint the walls, if the spaces between the floorboards still hold traces of your skin and hair, does part of you still reside there? Which makes me wonder. Could an American (or Icelandic or Balinese) zeitgeist be propagated anywhere else? Which comes first, the person or their place? What happens if you grow up in Swahili or Gaudi or in a basement or a tent or a houseboat, in an orchard or at the top of a Joshua tree? What about nomads and the jet set and homeless people? How do those with panoramic views differ from those who see nothing but a brick wall? What if every time you opened a window, you heard gunfire? What if the windows were nailed shut or if there were no windows at all? These are questions I can’t answer unequivocally. Who I am certainly has something to do with places I’ve lived, but there were also many places that left little impression, upon which I left no mark whatsoever. As a kid, I’d sometimes visit my father and stepmother at 59 Country Club Drive, a house that had once belonged to musician Steve Miller although I could not glean any intimate details about the rock star from walking those halls. I don’t remember much about the house except watching television there and I doubt I left any psychic imprint of my visits on those walls. Later, my father and his growing family moved to a huge place at 231 Forbes Avenue in San Rafael with six or seven bedrooms, a guest house, a nanny’s quarters, a servant’s quarters, a pair of carved lions at the entryway, and a pool. It was another dark, cold, empty place. I tried living with them for a year in high school but spent most of my time with my head stuck out my bedroom window, blowing smoke from my clove cigarette out over the roofline. At college in San Diego, I lived in a string of places I hardly remember, featureless apartments I can’t recall addresses for or locate on a map. I stare at Google maps, zooming and turning, but I can only remember amorphous, long-gone landmarks and have no idea how I got there or how they connect. For me, San Diego was a vague sunny blur of strip malls and chintzy apartment buildings and blond people with square, white smiles. In one of my journals I started a list titled You Know You Are A Grown-Up When…. Your mattress doesn’t touch the floor. And the space is not stuffed with dirty laundry or dustbunnies or stuff, either. There is actual air between your mattress and the floor. You don’t announce to everyone that it’s your birthday and they don’t remember and that’s somehow okay with you. You have real art hanging on your walls. Not a poster or fabric tacked up there. Real art in a real frame. You own a pan or maybe even two, a frying pan and one of those deep ones for boiling things. You own dishes to wash. You have more than one towel and a real laundry basket, not just a stretched-out plastic garbage bag. You have an iron and you know how to use it. To make creases, even. To iron cloth napkins. You don’t dust and wipe and clean the floors with your dirty clothes, because that makes no sense at all. You have a dentist. The dentist doesn’t wince when she looks in your mouth. You have a car and you have enough money for gas and insurance and registration and getting the oil changed and all those other grown-up things people with cars have to do without being reminded. You don’t eat popcorn for dinner. You don’t eat popcorn for breakfast, either. You eat fresh fruits and vegetables all the time. You remember to wash your face and turn off the radio before you go to sleep. I moved seven times in three years in San Diego. My address changed so fast it didn’t get recorded in my permanent brain file. I don’t even have pictures. This was in the 1980s, before digital photography, back when film was expensive and every time you took a picture you made a mental tally of how much money it was going to cost to see it. If I had pictures, maybe I’d remember but I wonder if I’d want to. Maybe I forgot those places because they weren’t worth remembering. Maybe I forgot because I knew I didn’t belong. Finding a place that really looks and feels like home doesn’t always happen. Most of us make do with the place we’re in but I imagine everyone must have a dream home, a perfect place they’ve built in their head, the ideal space for an ideal self. I like to pretend I’ll live there one day but it’s never going to happen. Even if I had endless money to spend, this ideal home could never get built because it is, by definition, a dream. Its features change according to my mood. It has amorphous edges, moveable walls, and adjustable proportions. It’s not a blueprint, it’s a patchwork collage of impressions and desires. My imaginary home has two tall stories and extremely spare modern lines. It’s made of recycled materials, wood beams, concrete, and lots of glass. It has a library with built-in bookshelves, an herb garden, and an enormous claw-footed bath tub. There are no neighbors and it’s always 78 degrees so I can walk around naked if I want. It’s surrounded by beautiful land, oak trees, a river, but also magically within walking distance to my mother’s house, a library, and a grocery store. When I open my eyes in the morning, I can look out the window at a vast expanse, including Mt. Tam and the bay and the city in the distance. I often see things that would be perfect for my dream house (huge paintings, a white sofa, a cashmere blanket, the perfect shade of grey or green or even pink, an enormous dining table that could fit the whole party, cacti in architectural planters, a collection of old Mexican animal pottery, etc., etc.,) objects I will never own because they don’t fit my real life. I used to lech after these things but now, I just take a mental picture and put it in the house in my head. It’s always clean in my head-house and our kids live with us forever because they never grow up (except when they do, at which point they will move to the beautiful house across the street so the grandkids can come over to play). There are so many rooms I can’t remember them all so I sometimes open a door and find one I’d completely forgotten-–a Turkish bath, a fully stocked pantry, a windowless womb-room lined floor to ceiling with fur, a closet that looks exactly like a train compartment with a moving picture window and fitted with seats that rock as if the room is running along a rail–you get the picture. The more I dream, the dreamier it gets. Although I’ve never lived in a dream house, I have felt like I’ve found home. Regardless of my ideal, the homiest places I’ve found had specific qualities in common: good light, modest proportions, and a distinct funk factor. I found those qualities in a studio on Haste Street near UC Berkeley, on a houseboat on an illegal dock in Sausalito, and when John and I had saved enough to buy our cedar shingled home in the flats of Berkeley that had partially burned down in the 70‘s and been fixed up by a boozy contractor who’d invite his carpenter friends over and for forties and games with power tools. Before he was done with the job he sold it to a woman who lived there with her aging mother and 17 indoor cats which had been “trained to use the toilet.” Being accustomed to small spaces, having had years of experience with squinting through the funk to past the superficial details to the heart of a place, with blind faith in the value of good light and bones, John and I decided this was the house for us. I have a photograph of him on moving day. The previous owner left a huge mess so there’s a ton of garbage heaped on the sidewalk behind him and he’s clutching his checkbook as if it might fly away. If you didn’t know better, you might think that for some reason this sad man has just purchased a pile of trash. The circles around his eyes are so dark it looks like his eyeballs have retreated from the horror, leaving two gaping sockets. His smile is a flat line. His smile wants someone to explain what the hell he got himself into. Nothing I could say would reassure him at that point; all I could do was grab a hammer and a broom. But we fixed it up quickly and yes, it was a smart investment. I planted beautiful gardens and John added rooms for our daughters and now, we’ve called it home for fifteen years, the longest I’ve ever lived in one place. When I think it might be the last place I’Il live, I’m simultaneously sad and relieved: sad because if you don’t move, it’s harder to change and happy because if you don’t have to move you can hunker down and fully experience the life you’re living. All the yearning and waiting and worrying and searching and comparing and packing and moving and buying and fixing and arranging and pulling down wallpaper and plastering and painting, all that dwelling on the surface of things is finally over. It’s finally time to take a seat and reflect for a moment, look around and fully appreciate where I am. Please excuse if this sounds familiar: this piece is amalgamated and revised from previous pieces. Here I am, busily buffing and polishing all the random bits and pieces, trying to wrestle it into something beautiful. How about you? How you doin’? What are you working on? Wow I love this! I feel like there’s one place in the world for everyone, one place where you feel more alive than anywhere else. It’s just a matter of finding it! I hope there’s at least one place, Riya. Thanks for reading. I could read a book’s worth of this. Hint, hint. An interesting concept. It’s one I’ve thought about before, but not in the same detail as you. I think where you grow up definitely changes who you are. Just a quick look at the stereotypes of people from different parts of each country can confirm that, let alone the stereotypes we have about people from different countries! I’m sure you have a lot to say about his, being in Beijing, Greg. Thanks for reading. What a treat to revisit some of your stories. So beautifully told, Anna. Inspiring! This is just beautiful. 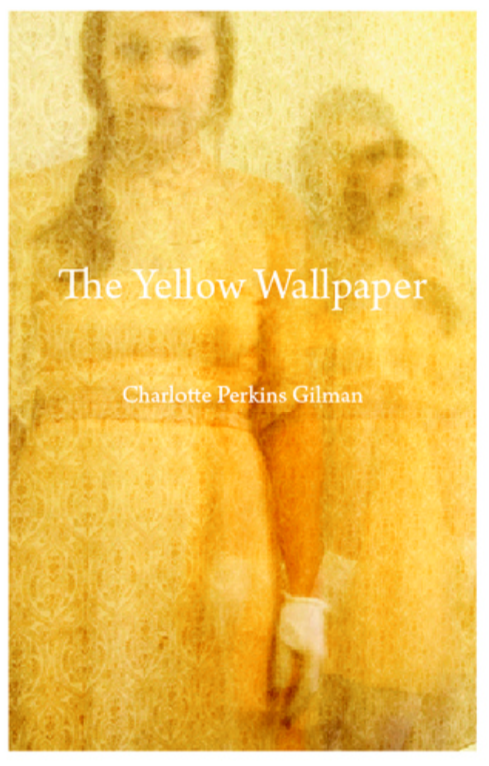 I recently read “The Yellow Wallpaper” and I just…this is beautiful. I feel like I need to read it three or four more times to really digest it properly.